UFO SIGHTINGS DAILY: Incredible Alien Skeleton Found On Mars In NASA Rover Photo, July 2016, Video, UFO Sighting News. Incredible Alien Skeleton Found On Mars In NASA Rover Photo, July 2016, Video, UFO Sighting News. This is enough evidence to rock the palaeontology world off its high horse. 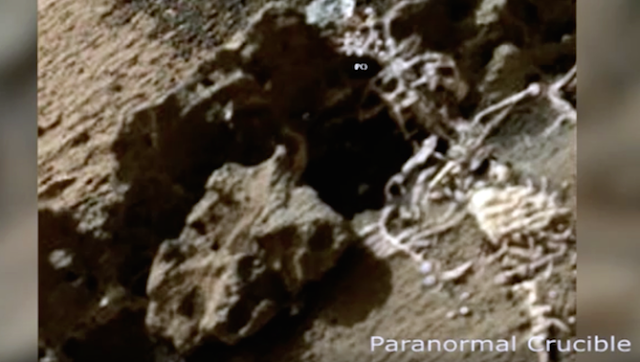 These skeletal remains of a living creature on Mars was found by Paranormal Crucible of Youtube. It could be an intelligent species, one of the creatures that controlled this planet. An extraordinary and unusual find that should change how we see Mars forever. One of subscribers alerted me to this artifact, and in my opinion its an ancient Martian skeleton. I gently colorized the image to bring out the details we can see in the video. The relic has a large skull adorned with an ornate or decorative head piece, this could indicate that its the remains of a king, religious icon or perhaps a fallen warrior. This is undoubtedly the skeletal remains of an alien humanoid in my opinion. I have cross referenced the relics remains and compared them with bones found in humans, and the comparison is undeniable. This added with my previous video of a dinosaur skull found by the Curiosity Rover, confirms without doubt that Mars did have life on it. I will add a HQ version of this image to my facebook page so you can do your own comparison.